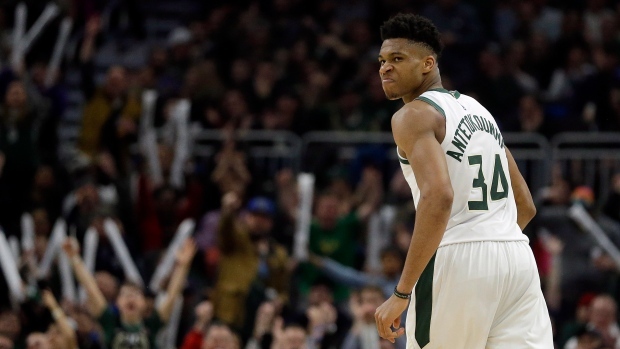 MILWAUKEE — Giannis Antetokounmpo delivered for Milwaukee once again, and Brook Lopez got going inside. Lopez added 25 points and eight rebounds as Milwaukee used a second-half surge to knock out Charlotte. It's just the second 50-win season in the past 30 years for the Bucks (50-16), who went 52-30 during the 2000-01 season and reached the Eastern Conference finals. "We have great belief in one another," Lopez said. "We can just play so many different ways." Charlotte, which has bothered Milwaukee with its switching defence this season, opened a 14-point lead in the second quarter before the Bucks closed to 59-55 at halftime. "The game was in the balance right there," Charlotte coach James Borrego said. "We were stretching them out with Frank as the 5, and they went inside to Lopez. You've got to give them credit. He's a handful; he can play inside and out." "Usually it takes a couple games to get back into the rhythm and get back in basketball shape," Antetokounmpo said. "He had three rebounds in a row. He dove for the ball and he got a deflection. "He kept us in the game and kept our energy really high. He was amazing tonight. He knocked down shots and was all over the place." "It was hard for everybody to get a rhythm; I don't know for what reason," Antetokounmpo said. "They were loading to me." The Bucks had their NBA-high 13th game of 130 or more points. Only the 1969-'70 (15) and 1970-'71 (14) Bucks teams had more 130-point games in franchise history. Hornets: Kaminsky, the former University of Wisconsin star, was out of Charlotte's rotation the last time the Hornets were in Milwaukee in late January. But the 7-foot forward has made an impact lately. He scored a season-high 20 points in a loss to Miami on Wednesday. "We needed some scoring punch off our bench," Borrego said. "Frank has given us that, stretching the floor, driving the ball. He's playing with a lot of confidence." ... F Michael Kidd-Gilchrist (left knee strain) and PG Tony Parker (rest) were not available, but C Bismack Biyombo returned after sitting out Charlotte's 112-111 win over Washington on Friday night. Charlotte started the night one game out of the eighth and final playoff spot in the Eastern Conference, in a three-way battle with Miami and Orlando. "We understand every game feels like a must-win for us," Borrego said. "We've been in the top eight in the conference 93 per cent of the season. There's a will to survive and win, and I think we have that." Bucks: G George Hill (left groin strain) missed his seventh consecutive game but could return at some point on the Bucks' three-game road swing that opens Monday in San Antonio, according to coach Mike Budenholzer. ... G Sterling Brown (right wrist soreness) has resumed shooting on a limited basis. He also has missed the last seven games. ... Veteran C Pau Gasol will continue his adjustment to the Bucks after being signed last weekend. The two-time NBA champion and six-time All-Star was released by San Antonio in time to be eligible for the post-season with Milwaukee. "It's a wide variety of experiences that he brings," Budenholzer said. "His international play, the things he has done with Spain. I think Giannis has an immense respect for him. To have guys like that in the locker room that can speak up or can say something in a timeout that's beneficial, all those things add up."